Hunter White (far right), of Point Pleasant, took part in the U.S. Naval Academy’s Summer Seminar in Annapolis, Md. POINT PLEASANT — Students have been on summer break for almost a month, and some members of the Class of 2016 are already trying to decide where life will take them after graduation next spring. 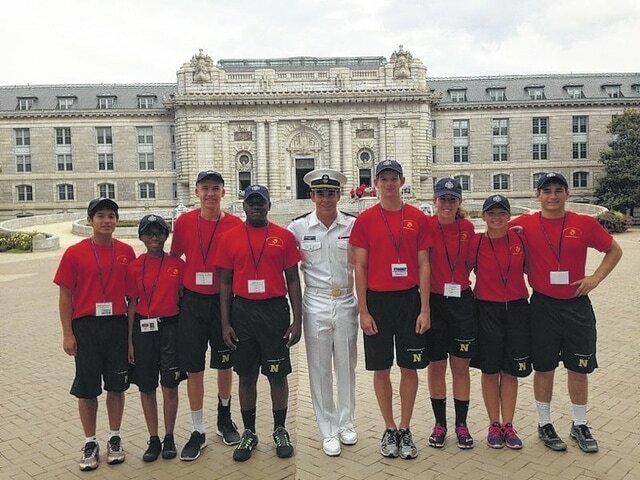 Hunter White, a student at Point Pleasant High School, attended the United States Naval Academy’s Summer Seminar on May 30 in Annapolis, Md. Although this trip was White’s first chance to experience student life at the academy, he said he had already thought of applying. White, the son of Sean and Becky White of Point Pleasant, said he had the chance to visit the U.S. Naval Academy through wrestling and said that was when he decided it was the place for him. White said he went back to the academy to visit and eventually decided to apply for the summer seminar. White said the seminar helped him understand what it is like to be a student at the USNA and gave him a chance to meet the professors. White said he enjoyed getting to know what the naval academy is like while he is still a student. He also said it increased his interest in attending the academy. White said he is working on his application to attend USNA. One major part of the process is getting a congressional recommendation. White said he hopes to be accepted into the academy and wants to do his part in serving his country. White also is attending a similar seminar at the United States Coast Guard Academy’s AIM program. Selection to AIM is based on leadership potential, personal character, academic and athletic achievement, plus his potential to contribute as a future Cadet. White, who left for the AIM Program on Sunday, said he was looking at USCGA as an alternate choice after high school.